SUMMARY: The characteristics of multiple sclerosis (MS) lesions on diffusion-weighted sequences and apparent diffusion coefficient (ADC) mapping at the very early phase of symptoms have not been clearly described. We report the case of a young woman who presented with a sudden pseudostroke form of MS resulting in hemiplegia and sudden aphasia. MR imaging showed a lesion of the left internal capsule with reduced ADC, which suggests an ischemic stroke. This case shows that very acute MS lesions may have reduced ADC on MR imaging, reflecting cytotoxic and not vasogenic edema. We report a case of a sudden-onset MS with right hemiparesis and aphasia. MR imaging, performed within the second hour after the onset of symptoms, showed a left capsular lesion appearing as an acute ischemic lesion with high signal intensity on DWI and a reduced ADC. A 36-year-old right-handed Portuguese woman, taking no treatment, was admitted for a sudden onset of right hemiplegia and aphasia. Her history included 3 episodes of spontaneously resolving (4–5 days) right hemibody motor deficit during a 13-year period (1989, 1994, and 1998). A brain CT scan performed in 1994 was normal. She remained asymptomatic after these episodes without treatment. Brain MR imaging performed in 1997 showed 4 high-intensity lesions of the white matter on T2-weighted sequences, including one right periventricular lesion without high signal intensity of the left internal capsule (Fig 1). 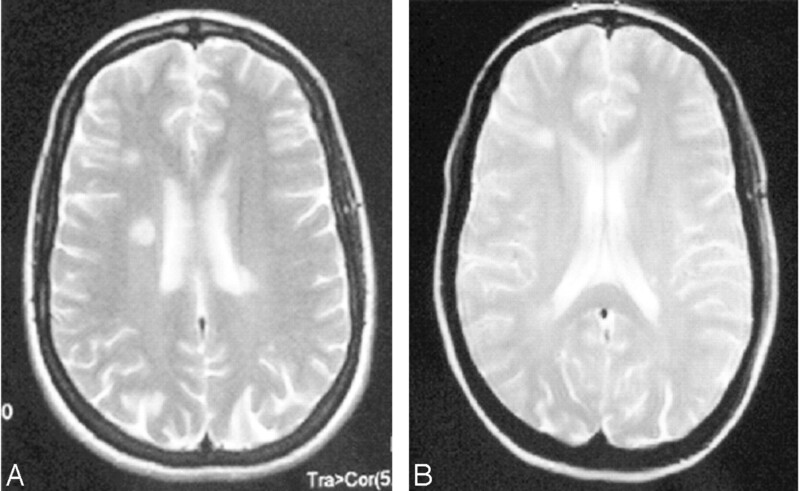 Brain MR imaging, T2-weighted sequence: high-intensity white matter images, 2 of which are periventricular. In November 2002, she suddenly developed right hemiplegia of the face, arm, and leg and aphasia for which she was referred for thrombolysis with a suspected diagnosis of stroke. MR imaging performed 2 hours after onset of the deficit showed a lesion of the left internal capsule (Fig 2). This lesion had high signal intensity on fluid-attenuated inversion recovery (FLAIR) images, high signal intensity on DWI, and a reduced ADC: 45.2 × 10−5 mm2/s for the region of interest versus 73 × 10−5 mm2/s for apparently normal white matter. Six other, older high-intensity images on T2-weighted sequences were observed in the white matter of both hemispheres that did not alter diffusion. Brain MR imaging 2 hours after onset of symptoms. A, FLAIR sequence, showing high signal intensity of left internal capsule. B, DWI, showing high signal intensity of left internal capsule. C, ADC mapping, showing reduced ADC of the left internal capsule lesion. In view of the initial recovery of the deficit, the disseminated white matter abnormalities on MR imaging, and the early high signal intensity on FLAIR images, the patient was not treated by thrombolysis, but anticoagulation with heparin was instituted. On the fifth day, the patient suddenly deteriorated with flaccid paralysis of the right face, arm, and leg. MR imaging performed on day 10 after onset of the symptoms showed extension of the left internal capsule lesion presenting a high signal intensity on FLAIR, DWI with b = 1000, and a heterogeneous ADC (one part with reduced ADC and another part with high signal intensity) (Fig 3). Brain MR imaging on day 10. A, FLAIR sequence, showing extension of the left internal capsule lesion. B, DWI, showing extension of the left internal capsule lesion. C, ADC mapping, showing heterogeneous ADC of the left internal capsule lesion. Neurovascular assessment showed no abnormality: electrocardiography, transesophageal and transthoracic echocardiography, and MR angiography of neck vessels and circle of Willis were normal. Cerebral arteriography was normal. A complete immunologic and infectious assessment did not reveal any abnormality. Lumbar puncture revealed a clear fluid liquid with normal cellularity and CSF protein. CSF electrophoresis demonstrated 3 oligoclonal bands with a high IgG index. Evoked potentials showed bilateral altered visual- evoked potentials (VEPs) and altered motor-evoked potentials (MEPs) on the right. An intravenous bolus of methylprednisolone (1 g/day for 5 days) followed by oral treatment for 1 month with tapering of the dose improved the deficit by the first week. The clinical course was favorable with recovery of gait by 1 month, but persistence of a deficit of the right hand and aphasic elements and clumsiness of the right hand at the third month. At 1-year follow-up, the patient presented only fatigability of the right leg on effort. MR imaging revealed regression of the left internal capsule lesion on FLAIR images at 6 weeks with a high signal intensity on DWI (b = 1000 and ADC) and no contrast enhancement at the second month (Fig 4). Wallerian degeneration of the left pyramidal tract was observed at 1 year. Subcutaneous beta interferon therapy was instituted. No new episodes were observed at 20 months of follow-up. Brain MR imaging at 3 months. A, FLAIR sequence, showing regression of the high signal intensity of the left internal capsule. 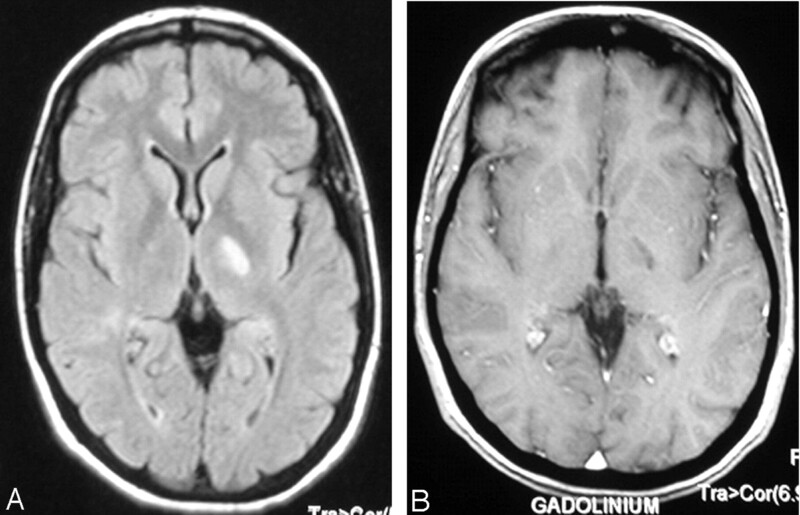 B, Gadolinium-enhanced T1-weighted image, showing no contrast enhancement of the lesion. The originality of our case concerns the difficult differential diagnosis between stroke and acute pseudostroke form of MS and the appearance of this lesion on DWIs, emphasizing the neuroradiologic diversity of MS lesions. This case report raises the problem of the differential diagnosis of the sudden onset of a neurologic deficit in a young subject, between stroke and MS. In particular, the case presented here shows that some very recent lesions can behave like ischemic lesions on DWI, with a high signal intensity on DWI and a reduced ADC. Accepted after revision July 7, 2005.